Pizza Shapes have ‘Flavour you can see’ covered in tomato, cheese, onion, garlic and paprika seasoning, guaranteed to get your mouth watering again and again. Arnott’s Shapes have been made since the 1950’s and are a favourite Australian snack, with over 53 million packs being sold a year! Wheat Flour, Palm Oil, Starch (Wheat), Tomato Powder, Salt, Cheese (contains Milk), Maltodextrin (Maize), Yeast, Milk Solids, Baking Powder, Sugar, Spice (Mustard), Garlic Powder, Onion Powder, Herb, Natural Flavour, Vegetable Extract (from Maize, Soy), Food Acid (Citric Acid), Colours (Turmeric, Paprika Extract), Antioxidants (E300, E307B from Soy, E304), Yeast Extract, Emulsifier (Soy Lecithin). Have tried all flavours of shapes but this has to be the tastiest flavour! So addictive and slightly fattening but an absolutely fantastic self-indulgent treat! 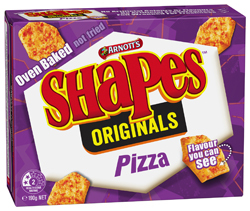 Arnott's Shapes - Pizza. Very tasty and more-ish! Healthy - er - well, they're baked, rather than fried. They're cheese and tomato flavoured, and the flavouring is dried which tends to concentrate the flavour. The biscuits are savoury. When I go to Australia, I make sure I have enough room to bring loads back! They used to be available in various well-known UK supermarkets, but alas no more. A great pity!